Users can custom set their blog post font style to a variety of web fonts selection provided by Google Fonts from Blogger Theme Designer under the Advanced options. Switching Blogger blogs font styles is the easiest & quickest way to make your blog stand out & look more personalized to your own style -- but do not overdo it! Unfortunately most custom Blogger themes available to download does not support this, unlike BlogrCart Blogger themes with shopping cart collection, which uses pretty much all existing Blogger platform theme functionality. However, when selecting any Web Fonts in Blogger Theme Designer, only regular fonts files is imported & applied. Which leaves the italic styles in your post body will only "tilt" due to the assigned <i> tag -- a browser default behavior. 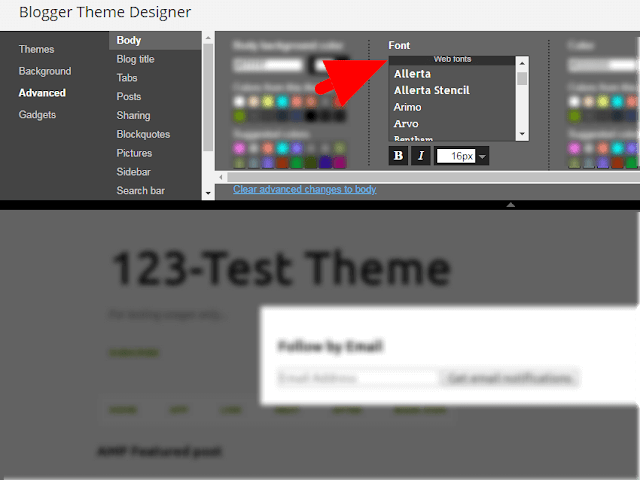 The same behavior when users select Italic for web fonts in Blogger Theme designer as the blog text styles. The italic font files is imported, which leaves the regular styles not available -- not what you want to achieve. Here's how to add italic web font file provided by Google Fonts when users have selected one in Blogger Theme Designer > Advanced option to fix italic styles in blog posts. Unselect "Regular" & select "Italic"
Paste the embed codes eaelier below <head> tag. Refresh your blog pages to see the changes. Did you encounter any issues with custom web font by Google Fonts used at your blog? Leave a comment below to further discuss with the community.